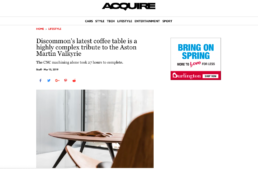 Discommon’s latest Aston Martin Valkyrie-inspired table has been featured in Acquire. The masterpiece took nearly 27 hours to complete and costs a whopping $17,000. Read what the mastermind behind Discommon has to say about the process of creating the table HERE. Multiple Clients Featured in MEDIUM's Spring Upgrade Ideas!